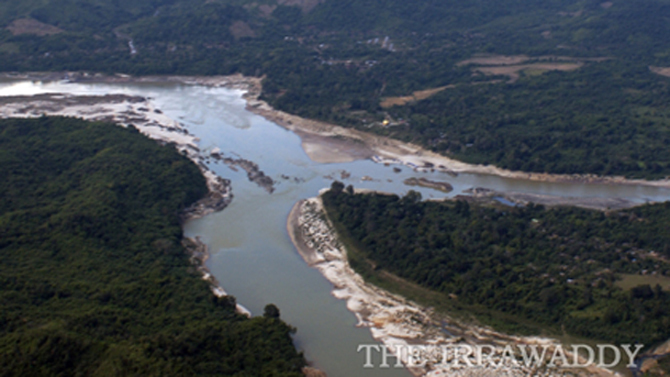 Burmese authorities have told hundreds of villagers living near the site of the suspended Myitsone hydropower dam project in Kachin State to leave the area within 10 days or face the consequences, according to a local group monitoring the project. In a statement released on Monday, the Kachin Development Networking Group (KDNG) said that five Burma army trucks and various government vehicles entered the village of Tanghpre on March 17 to enforce an earlier eviction order. “They ordered the villagers to get out within 10 days. They said they didn't want to see anyone in the village after that,” said KDNG spokesperson Tsa Ji, speaking to The Irrawaddy on Tuesday. Most of the residents of the village had already been forced to leave their homes to make way for the Chinese-financed dam. They began returning after Burmese President Thein Sein ordered last September that the project should be put on hold because of concerns about its environmental impact. However, China's state-owned China Power Investment (CPI), the main investor in the multi-billion dollar project, has since made a concerted effort to get it restarted. According to Tsa Ji, officials from CPI and its Burmese partner, Asia World Co., Ltd., visited Tanghpre recently to ask the village priest to move the local Catholic church to a new location. Tsa Ji said the request was probably made because the church acts as a key center for the exchange of information. Since the authorities showed up in Tangphre on March 17, residents say they've seen more signs of activity at camps for Chinese workers involved in building the dam. They also report seeing vehicles patrolling the dam site. Meanwhile, sources in Laiza, the headquarters of the Kachin Independence Organization (KIO) on the Sino-Burmese border, claim that about 400 Chinese trucks carrying construction materials recently arrived in a Chinese border town. It was not immediately clear if the materials were intended for use in Burma, but the sources said that they believed the trucks were preparing to cross the border. You have to expect more oppression by Army after EU and US lifted sanctions. Current slogan is just part of Government magic show. I don't see any practically changing in Burma apart from voice. If Military does not want to change and then the President has no power to change current injustice and unfair system in Burma. BURMA ARMY ORDERING ITS OWN PEOPLE TO VACATE FOR THE CHINESE? The Kachin people have ALL THE RIGHTS and PRIVILEGES to live and work on their ANCESTRAL LANDS of course. Thein Sein has ORDERED the DAMNED DAM PROJECT to be SUSPENDED. What are the communists from Beijing doing in Kachin Land until today? And 400 Chinese trucks carrying construction materials are going to cross the border and head for Myitsone Dam Project I bet. In case the Chinese revive the DAMNED DAM PROJECT, then "KILL THE CHINESE NEAREST YOU" for Burma's SOVEREIGNTY and TERRITORIAL INTEGRITY SHOULD BE OUR "BATTLE CRY" I say! Now is the time to start organizing the "Dam Busters"
This is not a good news. People of Burma to be aware of it. U Thein Sein & Co got headache. President Thein Sein made a promise. All work is to halt. Neither China not the military own Burma. Than Shwe should give back his brokerage fees. If Thein Sein doesn't keep his word there may be a risk of cilvil war, and all the good work undone. All recent deaths are noted internationally. Kachin for example is an utter disgrace, and the 'government' (which was never legitimate) would do well to address and call to a halt ALL human rights violations. This is more important a sign of legitimate governance (with people as the priority) than anything- including deals, development, business, tourism, crony airlines etc! If it is true, our president should take responsibility what he said. If he fail to do so, please resign immediately. Is the "glorious and patriotic Tatmadaw" now under orders from Peking to fight on behalf of the Chinese invaders? I thought their duty was to protect the citizens and defend the sovereignty of Burma. Shame on them! It goes to show that this Burmese government can never be trusted and unpredictable. As they try to put the economy on overdrive, anything can happen to foreign investments. One day is in and can be out on another. So the Junta, or whatever name they're using these days, continues to prostitute itself to their Chinese masters. They ruin the environment, and China will get all the power from this dam. The ex Generals get richer, the Burmese people get trampled on. I wish government should consider not only for environment, but also for the return of investment in the long run. If that area is reserved for nature and invest for tourist attraction like US Grand Canyon National Park, I suppose it will be one of the ASEAN attraction to the world and also can invite neighbouring countries tourist. The government should calculate cost and beneefit for those 2 projects for Myitsone area, national park or hydropower. How do we want to shape our country?